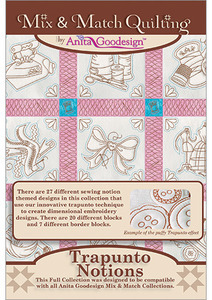 Trapunto Notions/Full Mix & Match Quilting Collection/ 27 designs total - 20 quilt blocks and 7 transitional/border designs in 4 sizes each (4.8”, 5.8”, 6.8”, and 7.8”). Traditional Trapunto was a very time consuming technique, because it was all created by hand. Utilizing a technique where you cut and place multiple layers of batting, we have found a way to create classic Trapunto techniques in your hoop. For our latest Trapunto collection we decided to do a sewing machine and notions collection. What better way to showcase this technique! There are 20 different main designs along with border designs. We have, of course, also included a step-by-step tutorial so you will master this technique in no time.